Brigette Lacquette is a defenceman from Cote First Nation and Mallard, MB. Following in the footsteps of older sister Tara, Brigette began playing hockey at a young age. Brigette plays for the Calgary Inferno and for the Canadian senior national team. Brigette made her senior national team debut with Canada in 2015 and has won medals with Canada at the 2015 and 2016 World Championships. Formerly playing with the University of Minnesota – Duluth Bulldogs, Brigette has been working tirelessly to make herself a core member of the senior national team for nearly four years. Named to the centralization roster for the Sochi 2014 Games, Lacquette (and fellow Manitoban Bailey Bram) didn’t make the cut. In December 2017, Brigette was named to Canada’s Olympic Team, and competed at her first Olympic Games in PyeongChang. 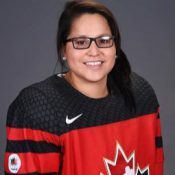 25-year-old Lacquette captured silver with Team Canada, and became the first First Nations woman to play hockey for Canada at the Olympic Games. CBC NEWS (Nov 1) Rebecca Johnston of Sudbury, Ont., scored a goal and an assist to pace Canada’s offence in the tournament-opener. Brigette Lacquette of Mallard, Man., and Toronto’s Natalie Spooner also scored, with captain Marie Philip-Poulin of Beauceville, Que., contributing a pair of assists.